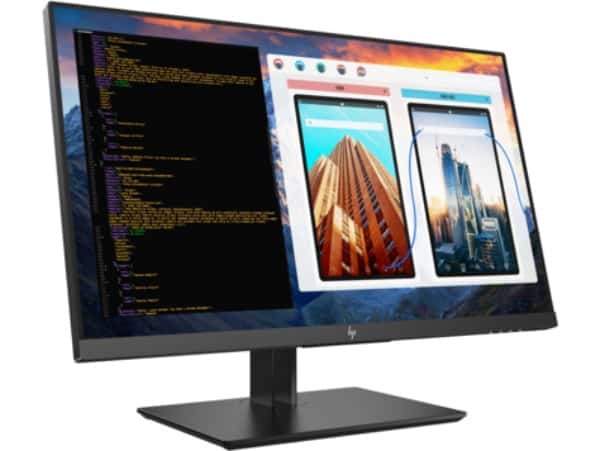 HP has launched the Z27, Z32, and Z43 to bring modern connectivity and impressive visuals for professionals who want an impressive monitor that is easy to use. This trio of nearly identical displays shows that USB-C and its capabilities are gaining even more ground in the market. The HP 4K USB-C- equipped Z27, HP32, and Z43 which are suitable for MacBooks and modern laptops will be available shortly to fill studios, offices, or your private study within this quarter. All three of the HP 4K USB-C Z series monitors share similar aesthetics which are contemporarily appealing, making them suitable for business settings or your home office. The Z27 has slim three-sided bezels while the slightly larger Z32 has a similar application on all sides. On the other hand, the HP Z43 has a slightly thicker layer on each side, which in our opinion, shouldn’t be an issue since this variant is so large. All three monitors will come with a sleek, matte black chassis with a standard-designed stand composed of a flat rectangle base with two thin metal uprights. Only the HP Z27 gets a complete range of ergonomics (height, tilt, swivel, and pivot) while the HP Z32 forgoes pivoting. The most substantial model, the HP Z43, will have to make do with tilt and swivel since monitors at this size rarely need to be adjusted vertically or viewed in portrait mode. The three HP 4K USB-C monitors are VESA compatible with completely removable stands if your choice does not provide the flexibility you want. This also allows users to mount them in multi-display setups, but the bezel design might not make one perfect for the other. The HP Z27 is the most suitable for horizontal dual or triple arrangements, while the HP Z32 is the best bet for a grid arrangement. 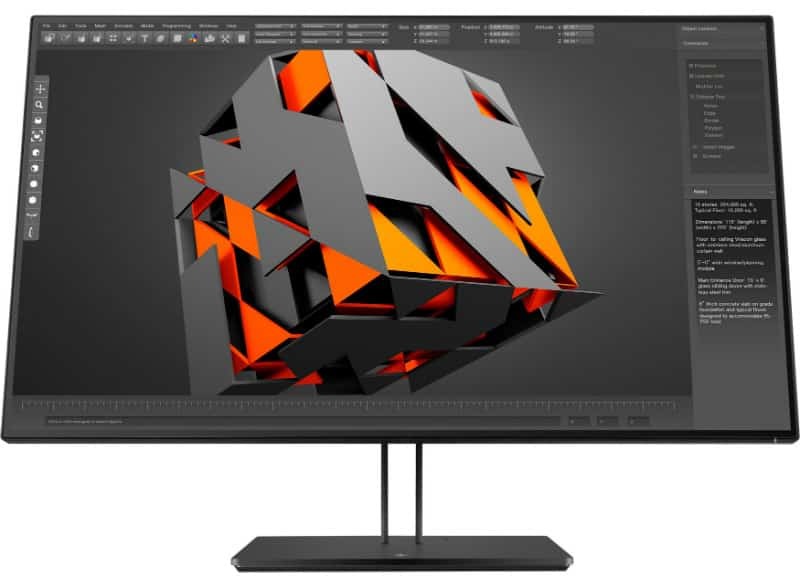 What’s most interesting about these HP 4K USB-C monitors is their connectivity options which open up even more types of configuration. The I/O panel on each gives users DisplayPort 1.2 and a Mini DP 1.2 as the primary video inputs and an HDMI 2.0 slot suitable for 4K consoles like the Xbox One X and PS4 Pro. But perhaps, the most attractive feature of the three is their USB-C slots which have capabilities that make each variant an excellent option for docking. All of the USB-C receptacles on the HP Z27, Z32, and Z43 will provide up to 65 Watts of charging power for laptops like MacBooks and Dell XPS variants. The connector will also function as DisplayPort 1.2 in alternate mode with HDCP 2.2 which makes it an all-in-one solution for your host devices. There are no premium-tuned aftermarket speakers included in the package, so you might need a decent set if you want one of these for an entertainment setup. Lastly, the three HP 4K USB-C monitors will include USB 3.0 hubs which can provide up to 15 Watts of power for mobile devices. Both the HP Z27 and Z32 will have three slots, while the 43-inch Z43 will include four. The HP Z27, Z32, and Z43 will utilize a high-quality IPS panel with a 3840 x 2160 native resolution, 60Hz refresh rate, and 8ms response time. These specs tell us that all HP 4K USB-C Z series monitors mean business, so we cannot expect enthusiast-level gaming performance from these monitors. What excellent about the panels used in these models is their 10-bit color outputs which almost guarantees comprehensive gamut coverages with superb accuracy. However, the brand only advertised sRGB coverage for the three 4K USB-C monitors. This limits their applications in the photographic field, but there are a lot of content creators out there who only really use sRGB modes. As long as accuracy is brilliant, these monitors should still be suitable for photo and video editing. The three 4K USB-C monitors from HP can accept a PC, laptop, and a gaming console, essentially acting as an all-in-one display for your command center at home. One downside we see is that there is no FreeSync functionality in these UHD monitors which is a necessity for 4K gaming. The 8ms response time might also induce blurring and ghosting in fast-paced sequences, although for the casual gamers, what the HP Z27, Z32, and Z43 bring to the table should be acceptable. The three HP 4K USB-C monitors are business models without any gaming prowess installed, but they present exciting developments in the display industry. 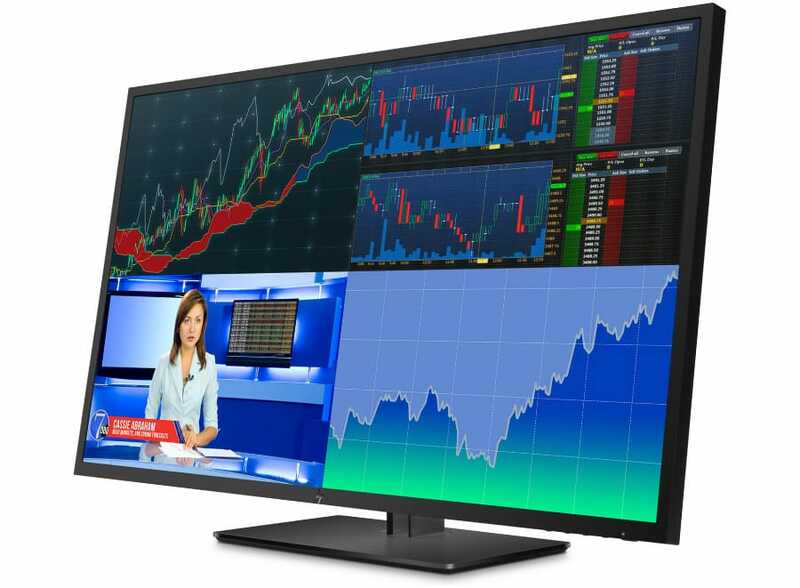 A fully functioning USB-C monitor is always the subject of requests and desires from both professionals and home users worldwide. Once released, these three models might change how we previously view USB-C monitors as hit or miss products when it comes to compatibility. If you are interested in the HP Z27, Z32, and Z43, rest assured that they will begin shipping from our favorite retailers shortly. All three monitors are now listed at HP’s official website with projected prices of $559, $799, and $899 respectively. If you want one of these three models, keep checking this article and the provided buy links for availability and latest costing. Hi, Krishna! You have to connect the USB-C Upstream slot to a USB-A slot on your PC using the included cable for the hub to function. Cheers! Is z32 glossy or just another matte screen? Hi, Roman! Its 3H Matte for the HP Z32.